In 1859, just a little over a year before actual fighting erupted, a man from northeastern Ohio called John Brown would provide the match that would ignite the country in conflict. Although he was born in Connecticut, his family moved to Hudson in 1805 when John was just 5 years old. As John grew up in the small community, he developed from his father and others in the community, a deep hatred for slavery. Northeastern Ohio was a hotbed filled with antislavery sentiment. At one rally in support of antislavery, John Brown stood up and vowed to dedicate his life to the destruction of slavery. John tried numerous occupations and ventures, but nothing was successful. He moved often from place to place trying to find his way. The only thing that Brown became successful at was inciting others in his personal hatred for slavery. 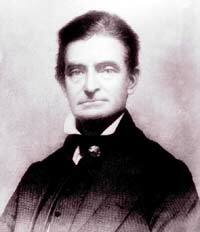 John Brown became an outspoken abolitionist. Later, Abraham Lincoln would call him a "misguided fanatic." Although many antislavery supporters detested the idea of slavery, they had different feelings about the rights of blacks. Not John Brown. In 1838, John Brown invited a number of blacks to the little church in Franklin Mills, Ohio. The congregation was astonished-- it was one thing to express support against slavery, quite another to actually have blacks in their midst. In 1856 John Brown led a group of men in Kansas against the residents of the small community Osawatomie known for its pro-slavery sentiments. Brown and his men went from cabin to cabin butchering those they knew were pro-slavery. All together they killed 5 people, cut off the arms and legs of numerous others. This put John Brown's name on the map of the infamous. In October, 1859, the former Ohioan led a group of 22 men against a federal armory in Harpers Ferry. Their goal was to take enough weapons that they could arm escaping slaves with weapons so they could rise up in revolt against slavery. The raid was over within 36 hours and Brown was quickly captured. The state of Virginia charged him with treason and hanged him in December. This act by the fanatical Brown, convinced many southerners that he was typical of all northern abolitionists. This opinion by the south is one of the main reasons they feared the election of Abraham Lincoln whom they also viewed as an abolitionist. After Lincoln was elected to the Presidency, in less than 4 months, the south succeeded from the Union, resulting in the outbreak of the Civil War.